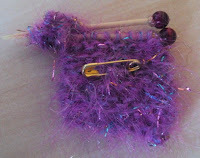 I've been making a new batch of my little hand knitted brooches. I decided to make these ones in novelty yarns and festive rich colours in pure wools. 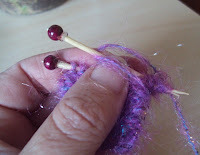 My miniature knitting needles are made with cocktail sticks and wooden beads and the little piece of knitting is in garter stitch. The gorgeous wooden buttons are handmade by Skipper with the wood from our old cherry tree in our garden. The buttons work so well with my hand spun yarn to give a natural look, they also look great on my many coloured bags and waistcoats. I glue a wooden bead on each cocktail stick needle. Each brooch is knitted on fine needles then transferred to the cocktail stick needles. I wind a small length of yarn around the needles to hold them together and make the miniature ball of yarn. A little gold pin is attached to the back, so as it can be used as a brooch. My brooches are always popular I shall be taking this batch to Christmas Crafts at Quarr Abbey. 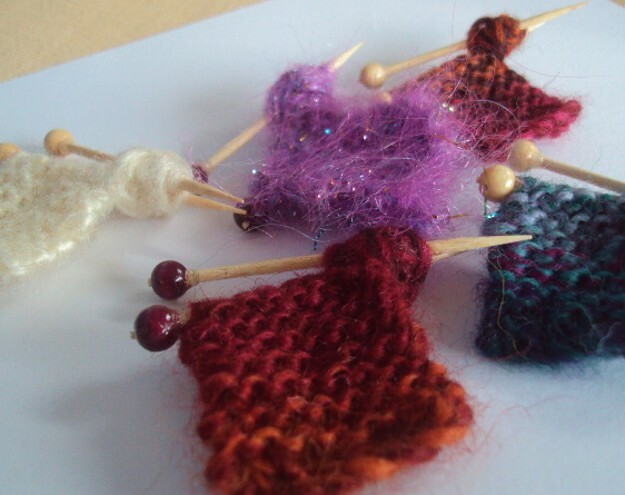 They make a perfect little treat for a keen knitter and an excellent stocking filler gift for Christmas. I shall have some of the wooden buttons and a selection of my dorset wheel buttons on sale too. I'm really pleased to have been able to find these new display stands in time for my next craft show this month. I'm looking forward to being able to display my knitting and weaving in a more creative way and these simple items in wood and calico will allow me to show off the colours and texture of work more easily. 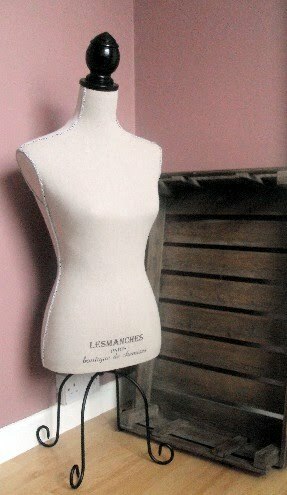 I'm particularly pleased with my new mannequin as I will be able to display clothing and accessories such as scarves in a natural wearable style. The Exhibition Gallery at Quarr Abbey is a lovely venue with it's plain white walls, tiled floor and beautiful old wooden tables to display work on. I don't know how I'm going to plan my area in the room as yet, in the summer I was there for my Open Studio event and I took my spinning wheel with me to demonstrate "spinning a yarn". This time we are back for our Christmas Crafts At Quarr Abbey. I'm looking forward to setting up a festive theme, do pop along to see us if you are on the island, there will be plenty of choice and ideas for Christmas presents on offer from hand knitting,weaving and felting to pottery,painting and photography. For more details of how to find us please click on link in the right hand column.